Sit back in the comfortable Norwegian leather recliners. Cook up a storm in the compact kitchen. While away the hours relaxing on the deck waterside. Unwind in the large queen bedroom. Freshen up in the walk in shower. Swim at the same level as the water outside in the loch or relax in the spa and sauna. It's work out time! Flex those muscles in the on-site gym. Lighter Quay is a secure fully gated community. The entrance to the underground carpark is on the left. Lighter Quay is located a short walk to Westhaven, the largest marina in the southern hemisphere. 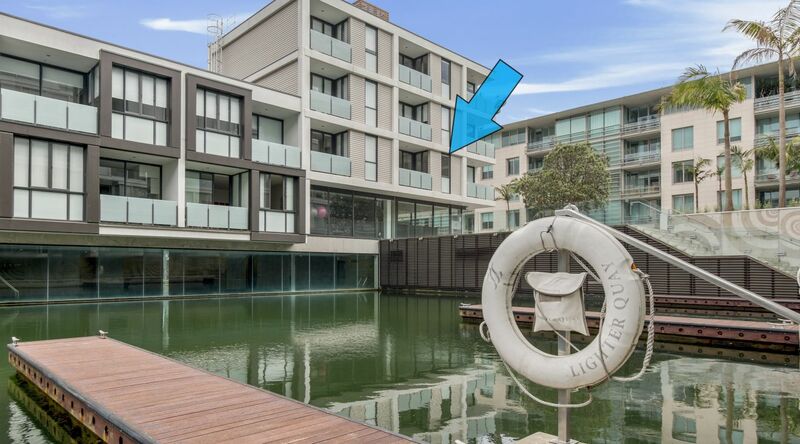 This apartment is located in Lighter Quay and has an open plan kitchen & living area that overlooks the water, with a bedroom that can be screened off with sliding doors. The water. You have so many choices of how you enjoy the private waterway directly below the apartment. You can enjoy the water views from the bedroom, or while you eat at the table, or you can sit back and relax on the balcony directly off the kitchen. The location is simply outstanding. Lighter Quay is located in the Viaduct Harbour precinct at the base of Wynyard Quarter. It is little more than a stone's throw away from the hustle and the bustle of the city, but provides a quiet relaxed setting. 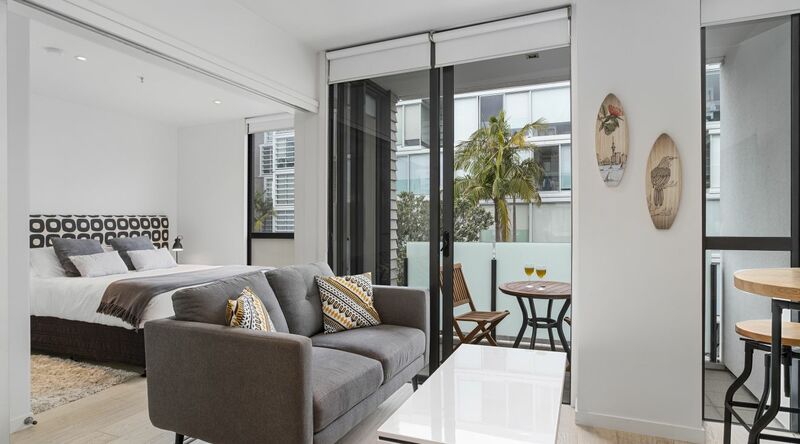 You will be isolated from the noise of the central city, yet at the same time however it's just a short 5 minute walk to most of Wynyard Quarter, less than 10 minutes walk to the restaurants of the Viaduct and less than 15 minutes walk to much of the CBD. This apartment within this fully gated, secure complex is the ideal base from which to explore Auckland and it's close to the many national and international corporate offices. The compact nature of the apartment means living is easy and the abundance of daylight is simply staggering. The size, style and location is very popular both for leisure and business travellers. A comfortable bed with quality linen guarantees a good night’s sleep. The apartment is in a residential area and close-knit community, so no parties are permitted in the apartment at all times during your stay. This applies to all residents, so ensures you will have a peaceful and quiet stay yourself. Although private, the apartment is located in a central city neighbourhood, so you will be surrounded by buildings and other residents. That’s not a downside, since the neighbours are generally a very considerate group of people, but you will be aware of their presence on occasion. Most people actually love it, since you will have a chance to meet locals and quickly strike up a conversation. Live like a local amongst locals and you will love your stay. This apartment does not come with a car park. This isn't an issue for most people as the fantastic location means it's easy to walk to your destination, catch an Uber, or take advantage of the convenient bike share (OnzO or Next Bike) or car share (CityHop) schemes. If you have a car, you can park on the podium for loading or unloading, and either park on the street (see below for prices) or the Maritime Carpark is located just 2 minutes drive away. This apartment does not come with a car park. This isn't an issue for most people as the fantastic location means it's easy to walk to your destination, catch an Uber, or take advantage of the convenient bike share (OnzO or Next Bike) or car share (CityHop) schemes. If you have a car, you can park on the podium for loading or unloading, and the Maritime Carpark is located just 2 minutes drive away. Free every night 6pm - 8am and all day Sunday and Public Holidays. Monday - Friday 8am - 6pm $3/hour for first two hours, then $6 per hour after that. Saturday 8am - 6pm $1/hour. Access to the recreation centre including gym, pool, spa and sauna is from 5 a.m. to 11 p.m weekdays and 6am - 10pm weekends. We will do our best to greet you at check-in. We also live a few minutes away, so we can pop over and provide assistance if required.